In addition to the city of Manama, Bahrain has desert, some villages, beaches, and assorted other sites. On two occasions now, I have visited the Shaikh’s beach. Imagine the most pristine beach you can. No surf. Just flat, brilliant blue water. There are actually some sand bars out in the water you can wade to and stand on. There is the music of children playing on them and calling from one to the other. Behind the beach is a plush lawn, dotted with palm trees, like veritable orchard. The place is dripping with flowers, mostly deep crimson, but many other colors as well. The sky is clear and the temperature is warm, but there are just enough clouds on the western horizon to turn the sunset into a blazing red, orange, and yellow panorama. It’s the Shaikh’s beach. He only allows westerners there. It is reported that he likes the western women in their bikinis. He has a beautiful house there, commanding a fantastic view of the water. If I ever get myself a beach house, this one will do. It is huge, but tastefully designed, so it doesn’t dominate the landscape. Several second-floor balconies overlook the Gulf, and there is a nice verandah on the ground floor. Cameras are not allowed, so I couldn’t get you a picture of the house, the sunset, or the grounds. Pity. They’re really lovely. 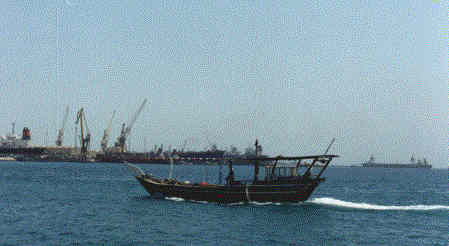 The picture above is from another view of the Gulf. A few days later, I went back. I got there too late to see the sunset, but it was still light, and unbelievably tranquil. There I was, looking out over the Persian Gulf, with a gentle breeze blowing on shore, this time strong enough to generate gentle waves. These are the only sound, except for the periodic call of a sea gull. A pier extended out into the water to my right, with the Shaikh’s house is over my left shoulder, and the moon rising over my right shoulder. This is a very nice place, indeed.